Let me first start by saying, I'm sure you've already seen swatches and what not. I was actually really late compared to other bloggers in receiving my little parcel. Probably the Royal Mail's fault. But either way, I have a long awaited review for you now. 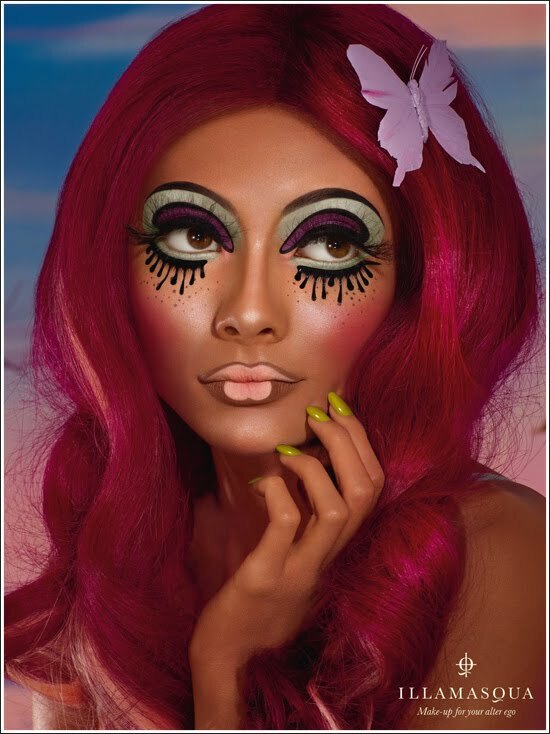 Unpredictable, uncharted and unnat­ural, Illamasqua unleashes Toxic Nature for Spring/Summer 2011, a colour collection born from a visionary concept of nature fighting back against the genetically modified society that plunders it. Illamasqua has created the Toxic Nature collection through a palette of lurid shades, corrupted hues and glistening muted tones that offer intoxicating versions of their original selves. I must admit when I first heard about this collection I was super excited and I still really love the whole collection but some of the promo images creep me out a little. Anyone else find that? I received the new Cream Pigment in Delirium, Flare lipstick and a nail varnish, which I'll post about when my nails aren't so raggedy. I also realised I bought the Divine Sheer gloss back in the Summer and it's been re-promoted with this collection. The Cream Pigments are something totally new from Illamasqua and I'm sure I wasn't the only person questioning whether or not the texture and slip of these would be like the Liquid Metals. It isn't at all. These are super matte and take a little warming up with your finger. They're super pigmented and really lightweight, they don't feel heavy or thick. Illamasqua suggest this as a contouring colour on pale olive skin tones. As well as a healthy flush for all skin tones and as a blusher and as a soft lip colour. These are completely multi purpose and can be used all over the face and body, and even in your hair! They can be used sheer or built up and are even water resistant. Definitely worth having at least one of these in your collection. A very yellow based matte bright orange. The photo really doesn't capture the true neon-ness of it. It's retina searing. I'm not the biggest fan of matte lipsticks but this applies really well, providing you line your lips with a brush first, just to make sure you get a crisp edge. This lipstick is really long wearing and leaves a stain behind with it. Plus it's bang on trend considering orange lips have been everywhere. I already have an orange lipstick from M.A.C but it looks more red when compared to this, although it isn't at all. A sheer bright fuchsia pink. Although this is my first Sheer gloss, it's still really pigmented colour wise. I often find with glosses that all colour is lost on my lips. With this I still have my natural lip showing through but it has a really nice wash of colour. These glosses are not as sticky as M.A.C but they're a little thicker so seem to stick around on the lips for longer. Definitely a fan of these glosses. Overall I love this collection, it's full of acid limes, neon oranges but it's also toned down with mint greens and lilacs. The best of both worlds? I'm sure there's something for everyone.